After several close calls in the past, David Kilgore finally earned a spot in the Bassmaster Classic. 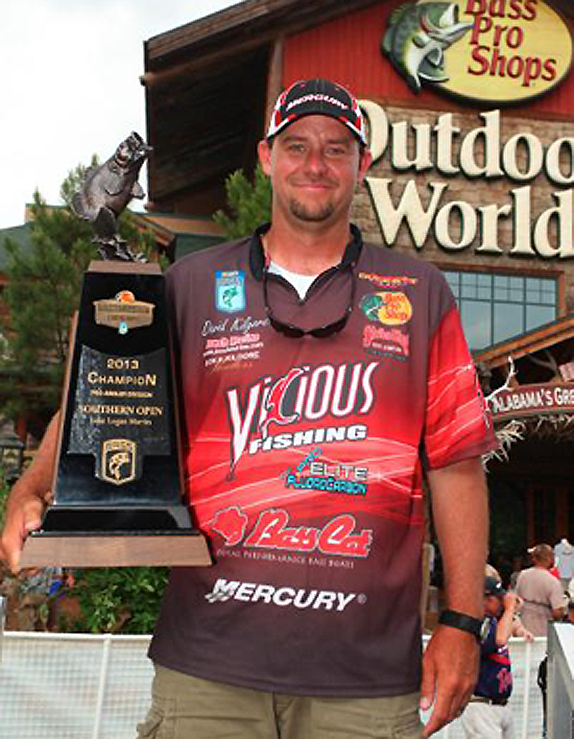 David Kilgore has been tantalizingly close to a Bassmaster Classic berth in the past. Back in 2009, when the top two finishers in each Open division earned a Classic berth, he was third in Southern Open points, missing out on the second of two Classic spots by 17 points. A year later, under the same format, he finished fourth in points. Just last month, he finished third at the Douglas Lake Southern Open, a sparkling finish at a dynamic lake, but yet another gut punch in his quest to fish in the sport's ultimate event. His wait is finally over. 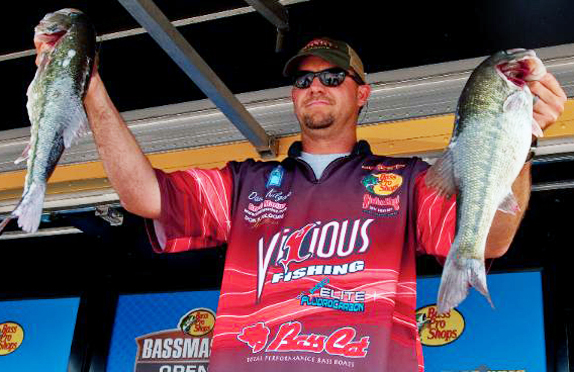 Thanks to his victory at the Logan Martin Lake Southern Open last week, the Jasper, Ala., native earned a trip to next year's Classic at Lake Guntersville. He averaged 15 1/2 pounds a day to hold off several Elite Series pros and notch his third career B.A.S.S. win. 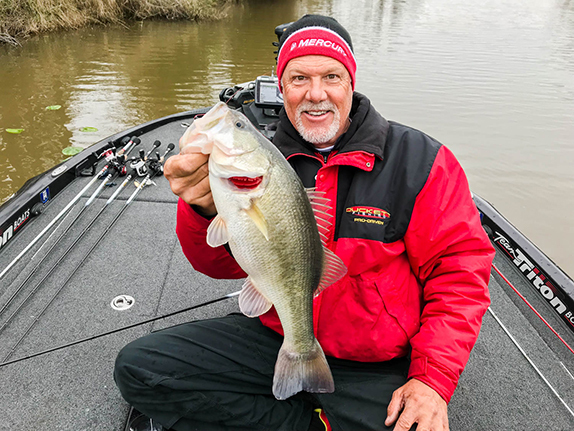 Despite having four fish in his bag on the final day, his winning total of 46-08 was more than 5 1/2 pounds better than runner-up Greg Vinson. "To be honest, I can't say that it has sunk in yet," he said. "If I had to say yes or no, I'd say, it hasn't. I keep waking up in the middle of the night thinking I have to go fishing because I'm leading but I have to do it one more day. Then I come to my senses and realize the tournament's over and that I won and then I go back to sleep. "I finished 3rd last month at Douglas Lake, which was great. The money's great and everybody called and congratulated me, but it still left that little place in your stomach where I was like, 'Do you know how close you were to Classic again>?' It didn't sit real well." 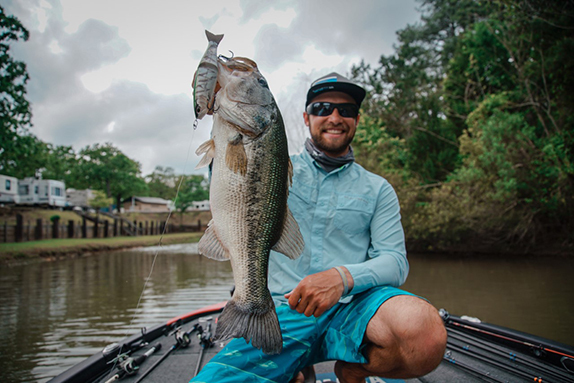 Logan Martin is like many lakes throughout the southeast this spring in that it's been several weeks behind schedule in terms of where the fish are in their seasonal patterns. While some of his competitors tried to take advantage of some late spawners on beds, Kilgore power-fished his way to victory, seizing on morning shad spawns before targeting largemouths holed up in shallow grass later in the day. Kilgore is pretty familiar with Logan Martin � he fished club tournaments there in the mid-1990s � but hadn't fished there in some time. "I know the lake fairly well," he said. "I don't know brush piles or things like that, but I know my way around." He owns a lake house on Lewis Smith Lake, a noted spotted bass fishery, so he was comfortable fishing for either largemouths or spots. "I'm no stranger to them," he said of spots. "I love to catch them and I sort of know how they act this time of year." He got started on practice the Saturday before the tournament and just went around junk-fishing to see if one technique worked better than others. "I caught about a 14-pound bag and thought it was something to start on," he said. "On Sunday, the junk-fishing wasn't working anymore, so on Monday I had to do something completely different. I started keying on topwater bites early to see what I could find. I was trying to find shad spawning on sea walls and I was just fortunate enough to just follow the shad. I could catch them all day long. It would slow way down after the morning, but I could still catch them all day long. I sort of knew what the shad were doing during the day and that helped." He caught several pre-spawners as well that clued him in that the lake was behind schedule. "In practice every day, I caught a couple 2 1/2 to 4-pound largemouths and they looked like footballs," he said. "They hadn't spawned yet. � There were still plenty up there. A lot of the spots I was catching hadn't spawned either. I did catch a few that had, but a lot of them had not. It was way behind." Kilgore said the bites came all day on the opening day of the tournament despite having to hop from spot to spot to avoid sharing water with other competitors. "I caught a good one in the first 30 or 40 minutes, then ran to some single docks, but couldn't get a bite," he said. "I ran to my other big fish spot and a caught a couple of good spots there and had another knock 10 feet of slack in my line and get off. By then, I had three good ones and a 2-pounder and a little baby that I wanted to get rid of." He ran back up the lake and quickly culled twice, once with a 4 1/2-pound spot and then with a 3-pound largemouth to give him 16-07 for the day, less than 2 pounds behind leader Chris Lane. He needed less than 2 hours to exceed his weight on day 2 as the early-morning bite was on fire with a Strike King Pure Poison vibrating jig. "I caught them real early and pulled off of them," he said. "It was pretty sickening. I knew I had at least 16 and once I got them out of the livewell to weigh them in, I realized I may have 18." From there, he targeted big largemouth the rest of the day, but wasn't able to upgrade. His 17-06 stringer boosted him to the lead, nearly 2 1/2 pounds ahead of Alvin Shaw with 1 day left. Kilgore took over the lead on day 2 after a memorable morning. "I just ran largemouth stuff the rest of the day," he said. "I was able to catch them good, but couldn't catch a big one. I was just trying to catch 20 pounds. I caught five that probably weighed 12, but couldn't cull. "That gave me a lot of confidence that barring that weather hitting that if I needed two fish the next day, I could go run that stuff for an hour and a half and catch me two 2 1/2-pound largemouths if I need them bad enough. I had a lot of confidence going into the last day." Then the rains came Friday night. He went on the final morning hoping the weather hadn�t rendered his key areas unfishable. "I remember thinking, 'I hope those shad spawn that morning,'" he said. "That thunder and lightning really scares those shallow fish to death. It was a pretty good (storm) with lots of lightning and thunder all around. When that hit, those shallow fish do not like that." Still, he managed two good spots in the first couple hours, then ran to his largemouth area and stuck a 4 1/2-pounder on the Pure Poison near some grass. "Then I ran to some stuff I'd found in practice, but hadn't fished on days 1 or 2 and caught a 13 1/2-incher for my fourth fish," he added. "I'm sitting there thinking, 'I need to go to my largemouth water to catch me a couple solid ones.' I tried that, but the grass that was sticking a foot out of the water the day before was now under water by 2 1/2 feet. It took me about 30 minutes to scrap that plan." He ended the day trying to coax a fifth fish with a shakyhead by the launch site, but ended up with four in the livewell. "When we took out, everybody started talking about how they had one or two and I was sitting there, thinking, 'This could be good,'" he said. "The conditions were just really, really tough on everybody. It ended up working out, thank God." > There wasn't much rhyme or reason to where he fished in the mornings. The only key was the presence of shad. �I fished docks over 10 to 15 feet of water where the shad were spawning,� he said. "Anywhere I thought they were spawning, that's where I fished. Later in the day, grass was key. I didn't win it that way, but it definitely helped me." > A cold snap during practice had the water temperatures down to the low 60s, but it was back into the mid 70s for the tournament. "With the colder water, I could catch them on more isolated places, but when the water warmed up, I had to catch them in areas," he said. > Vibrating jig gear: 7'3" medium-heavy Duckett Fishing White Ice Tim Horton Pro Series casting rod, Duckett Fishing prototype casting reel (7.0:1 gear ratio), 17-pound Vicious Pro Elite fluorocarbon line, 1/2-ounce Strike King Pure Poison vibrating jig (white silver flake), Strike King Rage Tail Baby Craw trailer (white). > He said the Vicious line gave him plenty of confidence around the snaggy docks. "You have no idea what I pulled those fish through under those docks and it didn't break. It was amazing," he said. > Swim jig gear: 7' heavy-action Duckett Fishing Micro Magic casting rod, same reel, 50-pound Vicious braided line, 3/8-ounce Strike King Hack Attack Heavy Cover swim jig (white), same trailer. > He tried other colors, but white always seemed to win out with the fish. "For some reason, even in that clear water they'd bite it better," he said. "I know it goes against the book, but for some odd reason it was the best color. I couldn't put it down." > Main factor in his success � "Not letting the Classic looming over my head really bother me. I really never got nervous the last day. You never know how you're going to react in those situations. I really kept my cool and kept my head. I never panicked." > Performance edge � "Just trusting my equipment � my BassCat and my Mercury � because I took some chances on the last day. I made some pretty long runs when I had four fish even though I probably didn't have to." > He's incredibly excited about his first Classic berth and even moreso that it'll take place at Guntersville. "Now, I get to go to Guntersville, where I've fished a pretty good bit, especially that time of year," he said. "It should be right in my wheel house so it's just going to be an awesome experience. I can't wait. We have another little baby due around Thanksgiving so he or she will be about 4 months old by then. I'll have another fan there cheering for me." > He also finished 9th in the Southern Open points, which should earn him an invitation to fish the Elite Series in 2014. 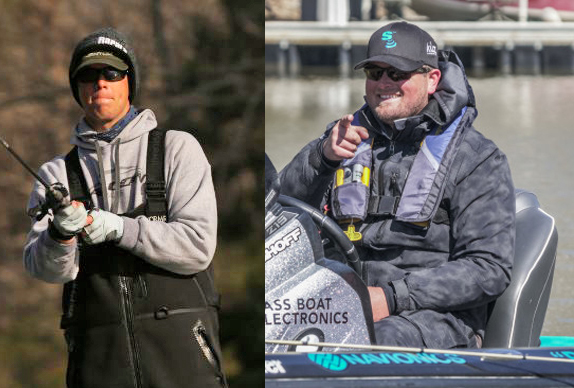 The Top 5 are guaranteed invites, but four of the anglers ahead of him � Lane, Vinson, David Walker and Aaron Martens � already fish the Elites so he'll likely garner an invitation. He's had the opportunity twice in the past, but declined both times. He said he'll strongly consider it this time around. "If they go down the list that far and I'm asked, with the Classic being out there this time, I have a little more leverage with sponsors," he said. "If I could find somebody that would be willing to help me fish the Elites a little more than I could get help the last time, I'd have to strongly consider it. You think, 'Are you good enough to do it?' Now, I've qualified for them three times. If I had some support from existing sponsors and new sponsors, I'd have to talk it over with my wife and give it some strong consideration. The last two times, I only had about a month to make up my mind and that's very difficult."